In Plato’s Greece, civil service candidates were required to pass difficult physical and cognitive tests. In China, the Han and Tang dynasties administered tests of literary style and the classics to hire the establishment bureaucrats. Aspirants were required to pass multiple three-day provincial exams and then take a final exam in the imperial capital. Modern hiring practices have centered on the idea of competencies—specific behaviors, skills, knowledge, and pertinent experiences—identified for successful job performance. 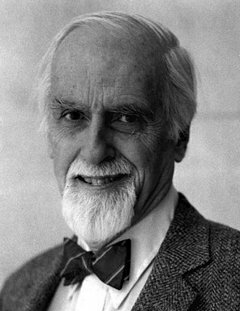 Harvard psychologist David McClelland first proposed the idea of ‘competence’. In 1973, he introduced a then-revolutionary idea that transformed how companies hire and promote people. In his influential paper, titled “Testing for Competence Rather than for Intelligence,” McClelland made a case that a candidate’s GPA, IQ, or scores from intelligence or aptitude tests were not all as valid predictors of job success as was then imagined. Begin by analyzing people who now have the job and people who held that job previously. Classify the star performers—say the top 10%—by some logical and meaningful metric. Compare the star performers to people who are merely average by a systematic method. Identify the traits, characteristics, and behaviors in the star performers and not in the average performers. Hire and promote people who have demonstrated the distinct traits and behaviors of the star performers. Over the years, McClelland’s paper has evolved into “competency modeling,” a widespread methodology that is now at the heart of how many companies manage talent and achieve professional development for employees. Not only are competencies often hard to define and understand, but testing for competencies through simulation or evidence is very difficult. Not to mention of how hard it is to assess employees quickly. Hence, at many “competency-driven” companies, human resources departments have dedicated teams to develop and implement competency models (see example from 3M, the Minnesota-based industrial and consumer products) to hire, train, evaluate, and promote employees. Competency models form the baseline criteria for identifying high-potential employees, and succession management procedures. What’s the size of the market for razors in China? How many golf balls does it take to fill a Boeing 747 aircraft? How many piano tuners are there in the world? Non-standard problems such as these are called “Fermi problems” after the distinguished Italian-American nuclear physicist Enrico Fermi (1901–54.) Fermi delighted not only in creating and solving them, but also in challenging his fellow scientists with similar problems. 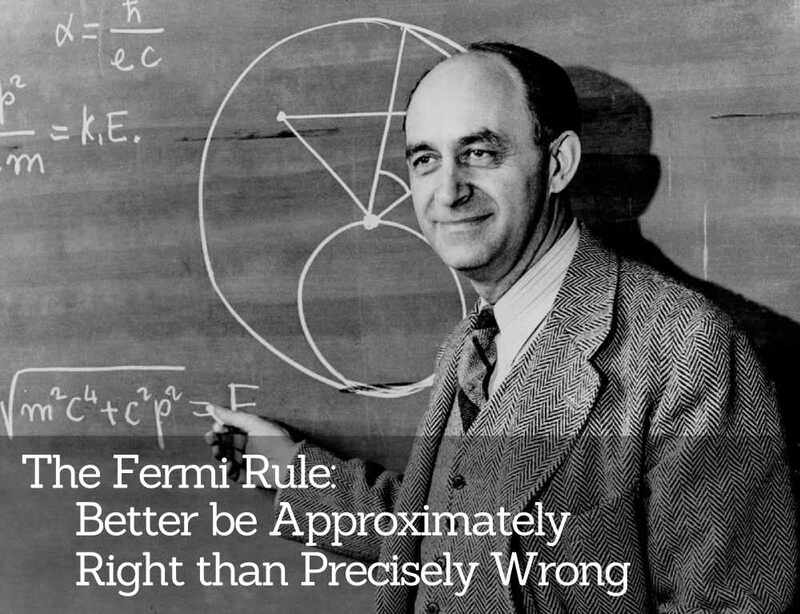 Fermi was celebrated for his ability to make fast, excellent approximate calculations with little or no concrete data. In one well-known example, when the first atomic bomb was detonated during the Manhattan Project, Fermi dropped a few scraps of paper as the shock wave from the detonation passed. After some coarse calculation, Fermi estimated the power of the blast from the motion of the scraps as they fell. Fermi’s guesstimate of 10 kilotons of TNT was remarkably close to the now-established value of 20 kilotons. Even though Fermi’s estimate appears 50% off, it was a reasonable order-of-magnitude estimate. Fermi believed that the ability to guesstimate was an essential skill for physicists. A good way to solve physics problems—and complex problems in any line of work—is by coming up with simple shortcuts to make approximate, but meaningful, calculations. Based on Fermi’s technique, at the beginning of many physics courses, professors pose problems such as “how many piano tuners are there in Chicago?” Such questions require students to employ quick reasoning and unsophisticated numerical methods to attack problems without the knowledge of any core physics concepts. The historical emphasis on the order-of-magnitude calculation was propelled by the lack of computing power available to solve complex problems. Such approximate calculations were considered necessary to decide if an onerous and lengthy full-blown calculation was required. Fermi problems are typically restructured by breaking them up into smaller problems that are easier for the students to approach than the original problem. The challenge of estimating the number of piano tuners in the city of Chicago is the classical example of a Fermi Problem. A problem-solver guesstimates the total population of Chicago, then the fraction of families in Chicago that may own a piano, and the frequency of piano-tuning, the time it takes to tune a piano, and so on. This sequence of thinking, accompanied by a few conversion factors, can lead to an adequate assessment of the number of piano tuners in Chicago. The Fermi technique is so popular that math buffs organize competitions in Fermi’s honor. Contestants are asked to estimate unusual assessments (the fraction of the surface area of the United States that’s covered by automobiles, the number of cells in the human body, the number of pizzas ordered this year in the state of California, for example) as closely as they can. One distinctive feature of Fermi problems is that precision is impossible to achieve quickly, but it’s easier to arrive at a fast estimate of the range for the right answer. Before investing a big effort to measure something with precision, problem-solvers can estimate the answer approximately—and only then determine if it’s sensible to do the extra steps to calculate the accurate answers. The ability to reach first-order estimations is an important skill in daily life. In a world where we are continuously bombarded with qualitative and quantitative information (and disinformation,) acquiring a solid grounding in numeric literacy has almost become an important intellectual obligation. Many problems are too complicated for you to come up with an accurate answer immediate. In analyzing such problems, precision may be impossible, but you can quickly estimate a range for the right answer. Guesstimation enables anyone with basic math and science skills to estimate virtually anything quickly using realistic assumptions and elementary mathematics. Microsoft, McKinsey Consulting, Google, Goldman Sachs, and many leading businesses use guesstimate questions in job interviews to judge the ability of the applicants’ intelligence, their flexibility to think on their feet, and to apply their numerical skills to real-world problems. Learn to do a first approximation of value and then, if the problem merits, refine your estimate further for much nuanced decision-making. Before putting much effort into calculating anything with precision, make a rough estimate of the answer, then decide whether it’s worth investigating further. Let me emphasize that this is simply a quick-and-dirty valuation tool and it shouldn’t be used as a precise measure of a stock’s value. But when I’m first looking at a stock and want to see roughly how it’s priced, this is what I’ll use. For example, let’s look at Pfizer ($PFE). Wall Street expects the company to earn $2.34 per share next year. They also see the company’s 5-year growth rate at 2.79%. If we take half the growth rate and add 8, that gives us a fair value P/E Ratio of 9.40. Multiplying that by the $2.34 estimate gives us a fair price for Pfizer of $21.98. The current price for Pfizer is $22.98, so it’s about fairly priced. Let’s look at IBM ($IBM) which has a higher growth rate. Wall Street sees IBM earning $16.61 next year. They peg the five-year growth rate at 10.58%. Our formula gives us a fair value multiple of 13.29, and that multiplied by $16.61 works out to a value of $220.75. IBM is currently at $201.71. 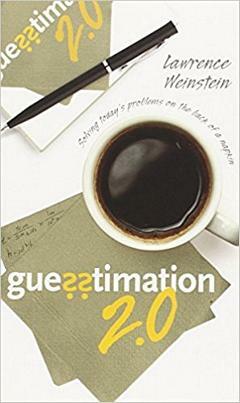 Guesstimation: Solving the World’s Problems on the Back of a Cocktail Napkin by Lawrence Weinstein and John A. Adam is a fun introduction to guesstimation. Sanjoy Mahajan teaches a course on “down-and-dirty, opportunistic problem solving” at MIT. His Art of Approximation in Science and Engineering course is accessible free of charge on OpenCourseWare. 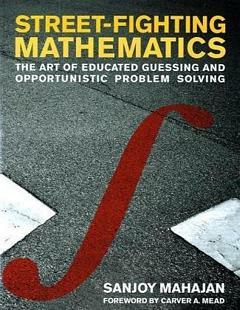 Mahajan has also written the resourceful textbook Street-Fighting Mathematics: The Art of Educated Guessing and Opportunistic Problem Solving. Some people are natural ramblers. Others are prone to ramble when they feel impassioned about a topic and have a propensity for going off on tangents. Others tend to blather because they feel jumpy and insecure when asked to talk about something they don’t totally understand. Still others feel compelled to talk just to make themselves heard or when they don’t want to lose the floor. Whatever the reason you may ramble, here are some ideas to help you be short and clearer in your conversations with others. During the first 30 seconds of an utterance, your light is green: your listener is probably paying attention. During the second 30 seconds, your light is yellow—your listener may be starting to wish you’d finish. After the one-minute mark, your light is red: Yes, there are rare times you should “run a red light:” when your listener is obviously fully engaged in your missive. But usually, when an utterance exceeds one minute, with each passing second, you increase the risk of boring your listener and having them think of you as a chatterbox, windbag, or blowhard. If you have nothing to say, say nothing at all. Don’t skirt around the topic, “fake the funk,” or seem indecisive. Simply say, “I am not educated about this topic.” If you’re asked something you should know about but don’t, it’s acceptable to say, “I don’t know, let me get back to you.” Do your research and follow-up with the audience. Once you’ve thought of your answer, simply state it. Do not add new details as you speak. Stick to your planned details and structure; you will be able to provide a consistent, concise, and well-reasoned answer. Avoid littering your conversation with irrelevant or trivial details. Often, it’s more important to be articulate than accurate. Keep your sentences brief and to the point. Don’t wander from your point. Sometimes you can defer a question by saying, “I’d be interested in what others think about this.” However, you will look devious if you use this technique too often. Prepare and rehearse. Before attending a meeting, event, or gathering, think about the likely topics people may want to converse with you about. Think about the message you want to get across and rehearse your responses. Short answer: decline politely. Say, “I prefer to give you a list of references after my interview.” Here is why. References are relevant only during the later part of the recruiting process, i.e. after a prospective employer has interviewed you and desires to check others’ impressions of you prior to extending you an offer. As a candidate, you should choose to describe yourself first to the prospective employer in an interview. Your references should represent your credentials only after you and the employer have established a mutual interest. This is the established protocol. Besides, providing references after an interview is respectful of your references. You would not want to bother your references too often or make public their contact information. The above guideline holds even if you are interviewing through a contracting firm or recruitment agency. Such intermediaries routinely complete reference checks before they present worthy candidates to their clients/recruiters. For that reason, the recruiting agency may contact your references after an initial interview with a representative of the agency. Subsequently, the agency may forward your references’ opinions to a prospective employer, but should not pass your references’ contact information. A couple of years ago, I compiled a list of job interview questions and loosely categorized this list by personal attributes, career performance, communication skills, team skills, managerial skills, and leadership skills. I have since shared this list with recruiting managers (interviewers) and job candidates (interviewees) who I have coached. I suggest that recruiting managers choose eight questions on varied topics for a thirty-minute interview. Job candidates can select twenty-five questions and practice answering these questions by recording and reviewing their answers. Why do you think you are successful at what you do? What you consider your biggest fault at work? Why do you think you have it and what are you doing about it? What defines a challenge to you? Describe the situation when your expectations were not met. What is a misconception people have about you when they first meet you? How do you maintain your passion in a place that lacks accountability? Tell me about a time when you felt culturally ill-at-ease and how do you cope with it? What is the single best quality that you have seen in people—a quality that you do not possess? What was a constructive criticism you received and how did you respond to it? Tell me about a failure. How would you know you failed in something? Tell me about a time when your belief was challenged. Give me an instance when your ethics have been challenged. Give me an example when you were criticised for your personality. If you had a month without any commitments, what would you do? What are people most surprised to learn about you? What do you consider to be your key values? Name a time when these values were challenged. What is something from your past that you wish you would have done differently and why? List three things that motivate you at work. What is your one personal trait you most admire and why? Which business leader do you admire? Why? 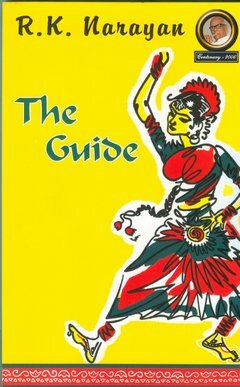 Tell me about the current (non-professional) book you are reading? What did you learn from it? Who is a prominent figure that you admire? Why? What is your biggest regret and thus far? What is the one impression you want me to leave this interview with? What were the high and low points in your life over the past few years? What was the toughest integrity violation you have ever encountered, and how did you handle it? Have you ever had to define yourself in the midst of criticism, and did you succeed? What class did you like the most while you were at school? Why? How have you pursued that topic since you graduated? When was the last time you were forced to step out of your comfort zone? What is the situation and how did you deal with it? Suppose you discover that you missed a significant detail six hours before a project deadline. What would you do? What you think about your current or former boss? Was there a time where you had to choose between good opportunities? Which one did you choose? Career-wise, was there anything in the last five years that you would have done differently? How does your current or last job relate to the overall goals of your department or organisation? Tell me about a time when you personally failed. How did you handle it? How do you feel about your career progress to date? What would your peers at this organisation say on your second year anniversary? When did you realise you needed a change in your career path? What was your best mistake? What about our position do you find most attractive? Least attractive? Tell me about time when you overcame a problem and took initiative. What was your most challenging work situation? What has been your most creative solution to a problem? What is the best idea you have ever had and why? What is the one thing you would change about how you performed in your job in the last few years? How have you changed the nature of your job? Tell me about a time at work when things did not go well. Describe the key characteristics of the business you are in. Describe your job. Being effective in this job means? What are the key things that have happened since you took this job? What did you do? Why? What effect did you have? What problems developed? How did you handle these problems? How effective do you think you have been in this job? Specifically, why do you say this? What are the performance measures? What is it about you, the job, or its context that has contributed to this level of effectiveness? What could you have done better? What are you trying to achieve in your career? In your life? Tell me about a time when you worked with someone and had a difficult interaction or disagreement. How did you resolve it? Describe a time when you had a conflict with a co-worker. How did you resolve it? Tell me about a time when your powers of persuasion failed. Give me an example of a time when you made a mistake because you did not listen well to what someone had to say. Describe the most challenging negotiation in which you were involved. What did you do? What were the results for you? What were the results for the other party? When a number of different people come to you with ideas about solving a problem, how do you go about using their information? Please give an example. Tell me about a time when you have had to stand or defend a position that was not popular or easily accepted? What was the hardest thing you had to say no to in the last two years? Have you ever disagreed with your manager? How do you approach resolving a conflict within a group? How would you pick a team? Tell me about a time when you had to deliver bad news to your team. Tell me about a time when you let your team down. How do you create accountability and create a strong team? Describe a time when you were working in a team and you failed. How did you resolve the situation? What characteristics do you look for in your team members? Describe a situation when your team fell apart. What weaknesses do you have or experience when you are working in a team environment? In the teams that you work with, how do you deal with disagreements between the team members? Who was the toughest person you have worked with? Discuss your worst team work experience. Describe five qualities that you would want your team members to have for you to work effectively with them. Tell me about a time when you lead a team and failed. What was the biggest mistake you have had when delegating work? What is your biggest weakness as a manager? How do you know when the project is working well? If it is not, how do you address the problem? Describe a time when you had to be assertive in giving directions to others. Tell me how you go about delegating work? How did you keep track of delegated assignments? Describe characteristics of a bad team member or supervisor you have worked with. What would you do if your boss in the job came to you requesting you to do something that you know is definitely dead wrong? Tell me about a time when your relationship with a colleague broke down. What did you learn from that? Tell me about a time when you helped someone else succeed without doing the job for them. Describe the situation when you had to micromanage. How did you go about it? What were the results? What is the most difficult aspect of being a manager? Tell me about an instance when you had to work with a difficult person? What did you learn? Give me an instance where you handled a difficult subordinate at work. Consider me to be your employee. I am not performing well. How would you fire me? Please play it out. Describe an experience where you motivated your followers. Why you think you were able to do it? Tell me about when you had to work with someone you did not get along with, or someone whose personality was different from yours. What would your subordinates say about you and your leadership style? How do you deal with difficult personalities? If you were the CEO of a company and had to do downsizing, what people would you layoff, and, how would you implement this? How do you handle working with people who are not good at their jobs? How do you evaluate the productivity / effectiveness of your subordinates? How do you get data for performance reviews? How would you describe your managerial style? How has changed over the past five or ten years? Give me examples of your hiring successes and disasters? Explain what you got right—and what you missed. Can you point to any of your people who grew up with your guidance and have gone on to succeed in your own company or beyond? Describe the qualities of a good manager or a leader you have worked with. Why are these important? How has your leadership style evolved from ten years ago? Define leadership. How does a good manager differ from a good leader? Tell me about a time when you challenged somebody else’s idea and generated a new business initiative or project. What kinds of decisions are most difficult for you? Describe an example. Tell me about a time when you influenced others who were not your subordinates. Tell me about a time when you saw poor leadership at work. When you start your own company, what qualities will you look for in people you choose to partner with? What is the most competitive situation you have experienced? How did you handle it? What was the result? Tell me about a time when you developed a new business opportunity. What was the impact? Describe a failure at work, how did you deal with it, and what did you learn from it? What will be happening in our industry five years from now? Have you ever been caught unaware by a problem or obstacle that you had not foreseen? What happened? Tell me about a time when you overcame a problem or took initiative to solve something. Describe a project where you preferred a common sense approach to an analytical approach to solve a problem. What is your leadership style? How do you build consensus without using authority? Some people consider themselves to be ‘big picture people’ and others are ‘detail oriented.’ Which are you? Give an example of a time when you displayed this. What do you think is the most important thing a business needs to develop? What you think are the three qualities of a leader? Give me an example of a situation in which you exhibited each of these. If you had to assemble a team to work on a project, which three celebrities would you choose and why? Describe a situation when something went totally awry. In your present position, what problems did you identify that had previously been overlooked? How do you get new ideas? Tell me about a time when you saw a solution before everybody else. Tell me about the most impactful failure in your life? What did you learn from it? Tell me a situation where you took risks. What innovative procedures have you developed? How did you develop them? Who was involved? Where did the ideas come from? What is the role of management in today’s global economy? What are the toughest decisions you have had to make in the last few years? What was your biggest management challenge, and how did you handle it? In your career, what is the best example of you anticipating market changes that your competitors did not? When did your curiosity lead you to probe deeply and uncover a competitive trend or marketplace dynamic that others did not see, or, did not want to see? People frequently borrow ideas they have seen elsewhere and then apply them in a new setting. How have you done this? 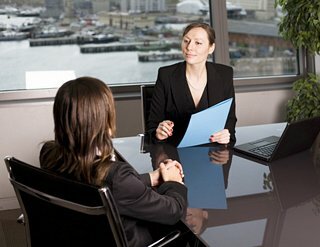 Behavioral interviewing is a popular approach to assess a candidate’s past experiences and judge his/her response to similar situations on a future job. This variety of interviewing is based on the premise that past performance in comparable circumstances is the best predictor of future performance. Rather than ask hypothetical questions (E.g., “How will you handle…,”) interviewers ask more specific, focused questions (E.g., “Describe a time when you had to…”) to elicit concrete examples of desired behaviors from the past. For example, instead of asking an interviewee, “How will you deal with a team member who is not pulling his weight on a project?” as in a traditional interview, an interviewer using the behavioral technique may ask, “Describe a project where one of your teammates was not pulling his weight. What did you do?” For further details and sample questions, see my earlier article on behavioral interviewing. 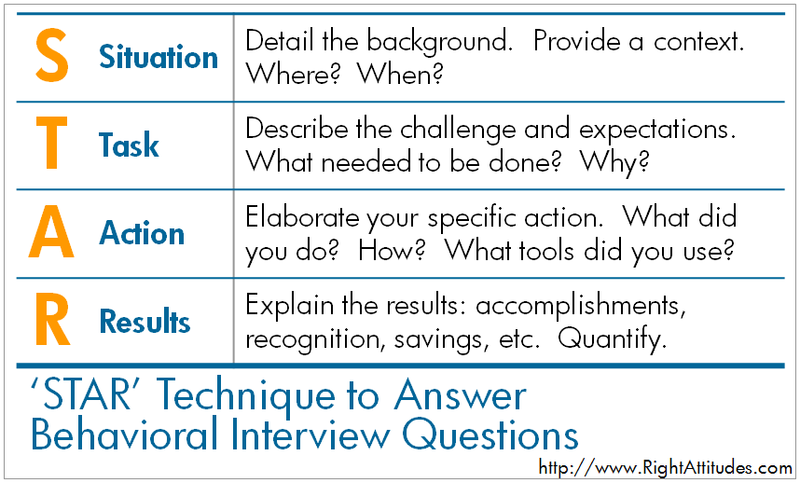 Instead of allowing the interviewee to theorize or generalize about events, the interviewer expects the interviewee to narrate four details for each experience: (1) what the situation was, (2) what the challenges were, (3) how the interviewee dealt with the situation, and (3) what the outcome was. Make sure you understand the question before you start to answer. You may paraphrase the question and ask the interviewer if you understand it correctly. If necessary, ask the interviewer to repeat the question. Do not, however, ask the interviewer to repeat every question—the interviewer may doubt your ability to listen. Organize your answer. Allow yourself five to eight seconds to collect your thoughts and structure your response. Interviewers appreciate this break and could use the time to drink some water, review their notes, or rest their hands from note taking. State your answer. Try to limit your answer to about three minutes. Three minutes is long enough to relate a story completely and short enough to hold the interviewer’s attention. Do not digress from your plan. Resist the temptation to think of new details as you state the answer. By sticking to your planned details and structure, you can provide a consistent, concise, and well-reasoned answer. Answer follow-up questions. In response to your three-minute answer, the interviewer may pose additional questions. These questions may require simple ‘yes’ or ‘no’ answers or brief elaboration. In behavioral interviewing, every answer should specifically address the skill in question. Your response should relate an experience from a previous job assignment, project, academic study, or community work. Present a diverse set of experiences. Suppose you are asked six behavioral questions during a thirty-minute interview. Supplementing each question with a distinct experience will help you portray a wide range of skills and interests. 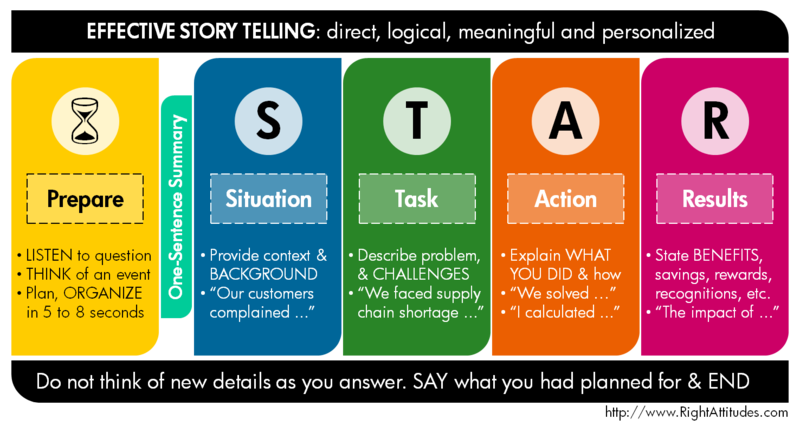 ‘S’ for Situation: Start your answer by providing the background of your experience. Describe the circumstances of your involvement. Provide enough detail to preface the rest of your narration. ‘T’ for Task: Describe the challenge at hand and what needed to be done. Give the expected outcome and any conditions that needed to be satisfied. ‘A’ for Action: Elaborate your specific action in response to the challenge. Specify analytical work, team effort or project coordination. Use ‘I’ and ‘we’ statements as appropriate. Below is a ‘STAR’ answer to this interview question. The interviewee’s response illustrates their ability to listen to feedback, adapt as a manager, and lead teams well. “The accomplishment that I am most proud of was being named ‘Consultant of the Year’ by Acme Medical Systems in 2002. When I worked as a product development consultant at Indigo, a team of Acme Medical Systems designers hired me to develop the plastic prototype of a new Computed Tomography (CT) scanner. Acme wanted to display their new cardiac scanner to their vice president who was visiting the following week. In preparation, I was asked to help develop the prototype of the CT-scanner’s new keyboard. “The keyboard is a large, intricate device with plenty of keys, knobs, and styluses. One of the primary challenges with prototyping this keyboard was that it was too large to fit into any standard manufacturing machine. In addition, based on the design’s complexity, I originally estimated that developing the prototype would take at least two weeks. We had just eight days, including the weekend. For the next week, I worked from 10:00 AM until midnight every day and over the weekend. On the first day, after studying the design, I proposed a modified, simpler version, which my clients accepted. The next day, I used my advanced CAD skills to digitally split the complex design into smaller components that could be manufactured individually and then assembled. The new modular design, in fact, facilitated the assembly plan. “Initially, my clients were concerned about the assembly process. I used a finite element model to reassure them and confirm that the assembly would be sufficiently robust. Since my clients were busy working on the rest of the CT-scanner, I offered to work with the suppliers. I visited five suppliers and prepared a manufacturing budget. After my budget was approved, I chose two suppliers and spent three days supervising the manufacturing process. Then, I worked with a third supplier to have the prototype carefully assembled, painted, and delivered the day before the vice president’s visit. “The end-result was that the prototype was prepared in half the lead-time and 40% under budget, even after paying the suppliers overtime. In addition, my modular design lowered manufacturing costs by 20% when the CT-scanner went into production. In recognition of my hard work and cost savings, Acme honored me among sixteen contenders with the ‘Consultant of the Year’ award. Consider the following questions. Practice your answers using the four-step ‘STAR’ technique. For more questions to practice with, see my compilation of job interview questions categorized by personal attributes, career performance, communication skills, team skills, managerial skills, and leadership skills. In answering interview questions, the best way to impress an interviewer is to discuss your credentials and accomplishments in terms of personal success stories. The ‘STAR’ technique is probably the best method to structure answers to interview questions. By following this simple technique, you can narrate direct, meaningful, personalized experiences that best demonstrate your qualifications. A job candidate that I once interviewed claimed credit for a new customer-service strategy across her company. Following the interview, in speaking with her references, I discovered that the candidate was responsible just for implementation of a corporate-wide initiative only in her particular facility. She had done this job exceedingly well; however, the initiative was not her idea, nor was the new IT-system installed to support this initiative, as she had claimed. Further, her work was restricted to her location only. Clearly, the candidate had overstated her achievements. She had likely used too many ‘I-I-I’ answers. One of the persistent problems with the job interview process is that candidates tend to exaggerate their achievements in their résumés and in interview discussions. Interviewing is, therefore, one of the toughest managerial-tasks: in the 30-or-45 minutes of a face-to-face interview or a telephone interview, it is very difficult to identify specifics of a candidate’s achievements and place them in a border context. A job candidate can easily distinguish himself or herself by helping the interviewer with this challenge. In the modern organisation, a lot of work, and consequently, success, is a function of circumstances—of opportunities available and teamwork. Success is often about being in the right place, at a right time, with the right people and doing what is right. On the other hand, interviewers from specific backgrounds tend to use too many we-answers. Cultural upbringing may encourage these candidates to display humility, be modest in discussing achievements and consequently avoid I-answers where possible. I can think about numerous instances when I have requested interviewees to stop using we-answers and describe achievements specifically in terms of what the candidate did–by using the I-answers. establish the bounds of your contributions and claim credit you deserve for your achievements. In answering interview questions, the best way to impress an interviewer is to relay your credentials and accomplishments in terms of personal success stories—first-person answers alone achieve this effect. Use constructs such as “I did this …,” “my team discovered that …,” and so on. Answering questions in the second-person amounts to advising the interviewer–that can be a turn-off. And, by using the second-person, you sound disconnected from the topic of your answer; you cannot relay a personal experience that provides clues to the specific skills the interviewer is looking for in asking a particular question. In interviews, use first-person answers exclusively: present lots of ‘I’ answers and the occasional ‘we’ answer. Do not answer in the second-person. Further Reading: The ‘Point of view’ page on Wikipedia offers details on the narrative first-, second- and third-person styles. Your employers, both current and former, expect you to treat sensitive and confidential information ethically. Accordingly, you must not disclose such information outside the company—in an interview, trade show or party at home. During an interview with a competitor of your current or former employer, describe your past projects and accomplishments in terms of concepts and particulars that are public knowledge. If the interviewer presses for additional information, be diplomatic and decline to present confidential information. Interviewers will appreciate your reluctance. Public trust and ethical behavior are vital to organizational and individual success. Recent corporate scandals have underscored the need for organizations to build and foster ethical business environments. Organizations are therefore inclined to select employees who share such moral values. Good corporate ethics policies prohibit current employees from disclosing proprietary information from/about their former employers. In asking you for sensitive information, the interviewer is probably setting up a trap for you—the interviewer may be checking if you demonstrate a high degree of integrity and professional conduct. Declining to provide proprietary information will demonstrate your consideration of the ethical consequences of your actions. Consequently, you will earn the respect of the interviewer. 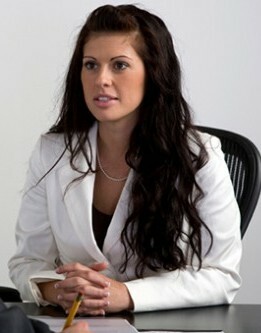 Behavioral interviewing is a popular approach to screening job candidates. It is based on a philosophy that assessing a candidate’s past behavior and experiences is a reliable indicator of his/her response to identical situations in the future. Screening candidates gives interviewers a glimpse into an applicant’s characteristics, skills, and experiences to determine their fit for a position. Unlike a traditional interview, which poses hypothetical questions, in behavioral interviews interviewers ask questions intended to elicit concrete examples that reveal whether the candidate demonstrated particular behaviors or skills in the past. Describe a time when you had to …. What did you do? Give me an example of a time when you had to …? Quite often, an interviewer structures questions such that a candidate cannot note the particular personality trait the interviewer seeks. Instead of allowing the candidate to theorize or generalize about events, the interviewer expects three details of each experience: (1) what was the situation, (2) how did the candidate deal with the situation, and, (3) was what the outcome. Describe a situation when your team members disagreed with your ideas or proposal on a project. What did you do? Tell me about a time when you discovered a problem before anybody else on your team. What was the nature of the problem? How did you handle it? Did you ask for help? Give an example of when you had difficulty getting along with a team member. What made this person difficult to work with? How did you deal with the situation? Tell me about a time when you have had to reject a customer’s request. What reasons did you give? How did you communicate? What was a constructive criticism you received recently? How did you respond to it? Did your relationship with this person change? For more questions, see my compilation of job interview questions. For more on how to impress an interviewer by discussing your credentials and accomplishments in terms of personal success stories, see my article on the STAR technique.